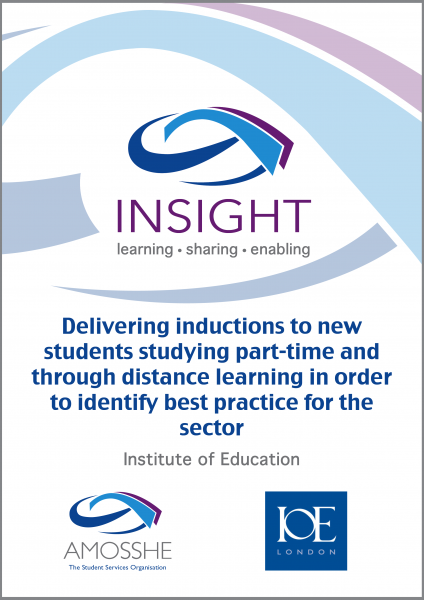 This project: 'Delivering inductions to new students studying part-time and through distance learning in order to identify best practice for the sector', undertaken by the Institute of Education, aims to identify effective ways of delivering induction to new students who are studying part-time or through distance learning. Principal investigators: Clare Hewitt, Assistant Registrar, Student Support. Total award from AMOSSHE: £1,500. Identify effective ways of delivering induction to new students who are studying part-time or through distance learning. Learn from student experience and work with students to ascertain what could be considered best practice in the sector. Identify different ways in which inductions are currently delivered. Create recommendations based on student need that can be used across the sector. The project will begin by looking at how general and course inductions are delivered for these students in the Institute of Education. The project investigators will conduct a survey and focus group with these groups of students to ascertain what worked, what they remembered from their induction and what their expectations / recommendations would be. The project investigators will also work with University College London (UCL) colleagues, with whom the Institute of Education has a stratgic partnership, to compare induction activities. The project investigators will also conduct a survey of AMOSSHE members to ascertain what induction techniques they used with these groups of students. The resulting report will compile information garnered from these sources and make recommendations. A description of the different ways of delivering induction, with case studies. Results of the survey of Institute of Education students regarding their induction experience. Recommendations regarding what this group of students’ expectations are and what the project investigators consider best practice modes of delivery and content of effective inductions.